Read More On "Understanding My Safari Tier Ratings & Experiences In Rwanda (TIER 1 - Premier, TIER 2 - Deluxe Or TIER 3 - Value)"
The Safari Tier 2 (Deluxe) rooming & safari activity rate in Rwanda starts from US $600 to US $850 per person/night sharing on average with the very few topping to around $1000 a night for a highly discerning and authentic experience. 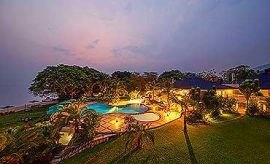 The cost is generally all inclusive of rooming, meals, drinks where included, park fees (except permits for gorilla, chimpanzee and golden monkeys), guided safari activities e.g. game drives and Rwanda hotel taxes (VAT) and service charges. Please note gorilla, chimpanzee and golden monkey permits are extra costs. The above pricing is a guide only specific to Safari Tier 2 (Deluxe) accommodations in Rwanda. Single room supplements are extra. Children under 12 years have a further discounted rate. All accommodation rooming prices are subject to availability and seasonally variant dependent on the month of travel. Our guests benefit from the total sum of the whole tour that includes best pricing for the level of tour services, excellent communication with your dedicated safari expert, knowledgeable/experienced planning services, tour customizations, jig-saw fit flexibility for travel in Africa, top notch guided safari experience and more importantly superlative customer care and service during and after your safari, tour and travels in Rwanda.